Windows 10 is a great upgrade. Microsoft paid a lot of attention to the feedback they ignored while developing Windows 8, and it shows. Unfortunately, some parts of Windows 10 are inexplicably bad and hostile to users. While Windows 10 as a whole shows Microsoft listening to feedback, parts of it show the same old Microsoft that dug its feet in and announced products like the original Xbox One and Windows 8 without appearing to care about many users. By default, Windows 10 automatically uploads Windows updates and apps from the Windows Store to other PCs over the Internet. This is a great feature when restricted to the local network, but Microsoft opts everyone into the Internet part of it by default, using your upload bandwidth for something that doesn’t help you. Worse yet, there’s no indication this is happening unless you read about it online, find your Internet connection slow, or get contacted by your Internet service provider because you’re using up your limited upload bandwidth. It could appear as an option in the custom setup process or a note about it could appear somewhere, but it doesn’t — it just works in the background. You have to find a special option hidden five clicks deep in the operating system to disable it. This potentially helps everyone download updates faster — it’s basically like BitTorrent for Windows updates. But many people, especially outside the USA, have connections with upload data caps. Microsoft is saving some money on bandwidth bills by using customers’ Internet connections, without telling them. 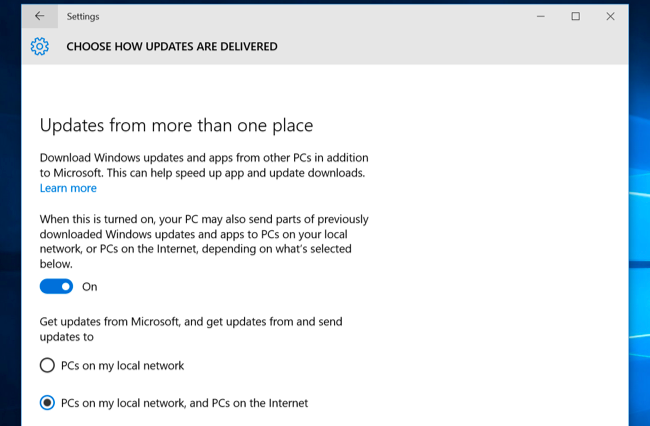 Windows 10 forces all home PCs to automatically download and install updates. That’s good in one way, as it keeps home Windows systems secure. But there’s a big problem with this: It’s not implemented in a respectful way. You can only configure the time Windows reboots — not when it downloads updates. Many people — again, especially outside the USA, but also in more remote or rural areas in the US — have Internet connections with bandwidth caps. They can’t necessarily download hundreds of megabytes of updates every single week. Some people have unlimited bandwidth during certain hours only — perhaps during the middle of the night. Windows 10 provides no way to tell Windows to only download updates during these uncapped hours. The one solution to this for home users is setting a connection as “metered.” Microsoft says you should set every connection with a data cap as a metered connection. This will give you control over when you download updates. 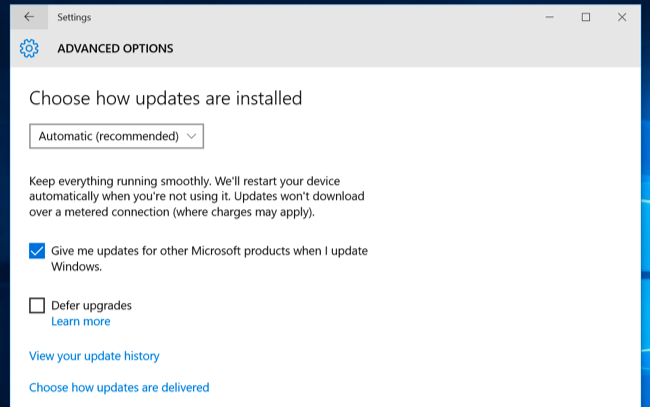 There’s just one big problem: Microsoft doesn’t let you set a wired Ethernet connection as a metered connection. If your home Internet service provider has data caps and you’re hooked up via a normal Ethernet connection, there’s no way to restrict those Windows Updates without shelling out $100 for the Professional edition of Windows 10. This is reminiscent of the original Xbox One, which demanded a nearly always-on Internet connection. Microsoft just assumes all its users have broadband Internet connections without any data caps and doesn’t seem to understand the connections many people have to deal with. Windows 10 is currently under a firestorm of controversy — even now being discussed in the mainstream media — over privacy concerns. Windows 10 is a big shift from Windows 7 and includes many more features that phone home to the mothership. Some of these can’t even be disabled. For example, the telemetry feature can only be disabled entirely on Enterprise versions of Windows. Microsoft should be explaining this a lot better and making it simpler to understand. We categorized 30 different privacy settings located all across Windows 10’s interface and the web, some of which offered confusingly vague explanations. Had Microsoft arranged these options in a better way with more explanation, they at least could have dulled some of the criticism. We feel a lot of the criticism is overblown, but Microsoft isn’t helping itself by remaining silent. Worse yet, Microsoft is charging onwards despite criticism. 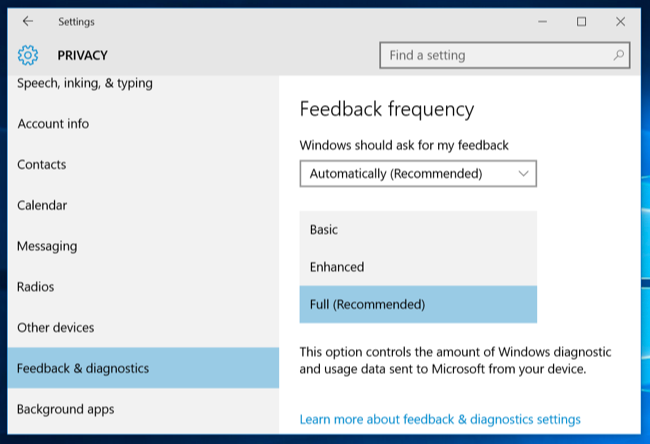 Updates to Windows 7 and 8.1 add the telemetry service from Windows 10, making Windows users sticking with older versions of Windows for privacy reasons upset. “By applying this service, you can add benefits from the latest version of Windows to systems that have not yet upgraded,” says Microsoft’s patch note. That’s just a ridiculous explanation — Microsoft may be getting some benefit out of collecting telemetry data, but the average Windows 7 or 8 user isn’t getting a “benefit from the latest version of Windows” after the telemetry service is installed. Microsoft is charging ahead with their vision of Windows as a service, planning to constantly update Windows 10 with new features going forward. Faced with all these constant updates, you — or businesses concerned about change — might want to see what these updates actually do. But Microsoft has no plans to actually provide any patch notes so you can figure out what they’re changing. Microsoft might occasionally provide information about big changes if they feel like it, but that’s it. There are now reports that Microsoft may provide some patch notes to enterprises, but that would be it. Microsoft is planning on updating Windows 10 on a continual basis with more than just security and bugfixes — with new features, changes, low-level modifications, and more. But Microsoft isn’t willing to actually inform their customers what’s changing. After years of using Windows 8 and then 8.1, any Start menu at all seems like a huge upgrade. But Windows 10’s Start menu actually isn’t all that great when you compare it to Windows 7’s. Microsoft added flashy live tiles and removed useful features. It may not work as well as it used to, but it does bombard you with information about hamburgers and Lady Gaga and football when you open it. There’s no way to pin apps you regularly use to the left side of the Start menu, for example. Worse yet, the Start menu now works in an entirely different way. It only supports 500 entries and will break after you add more than 500 shortcuts, just not displaying shortcuts to applications you’ve installed. They won’t be accessible via the Start menu’s search feature, either. That’s just sloppy and shows Microsoft is more worried about making a flashy live tile Start menu than a tool that will actually be robust in the real world for the PC users who need it most. Thom Holwerda from OSNews writes that Windows 10 is only well reviewed because it’s free and because reviewers haven’t forced themselves to use only those Metro apps, now called universal apps. You’ll still be mostly using desktop apps if you want a good experience on Windows 10. Even Microsoft themselves don’t seem confident about universal apps. 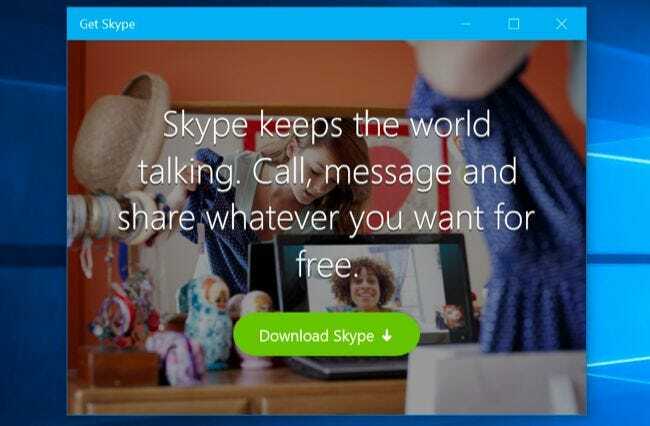 Microsoft unceremoniously killed the universal version of Skype a month before Windows 10 was out — they want you to use the desktop Skype app instead. The Metro versions of Office 2016 are all called “Mobile” versions to encourage you to not use them and get the traditional desktop apps instead. Even apps that are seeing a lot of development aren’t quite there yet. Microsoft Edge has a lot of issues, even when doing something as simple as dragging a tab out of a window. Remember, Windows 8 came out in 2012. It’s been three years, and those Metro/universal apps still aren’t compelling. Really, Microsoft was working on the Metro platform for years before Windows 8 was released, so Microsoft’s best and brightest have had 5-6 years to release some awesome apps and show everyone how it’s done. Instead, we have the Skype team going back to the desktop app and the Office team telling people not to use the universal apps on PCs. Those universal apps are just meant for smartphones and small tablets — that’s what the Office team at Microsoft is telling us. Maybe they’ll be more successful once developers can simply port their iPad apps to the Windows Store. Unfortunately for Microsoft, most PC users probably won’t want to use iPad apps on their desktop. Windows 10 includes “Get Skype” and “Get Office” apps, which are literally just universal apps that just tell you to download the desktop apps. Microsoft is also using these ads to spam Windows 10 users with ads, so they do have another function. 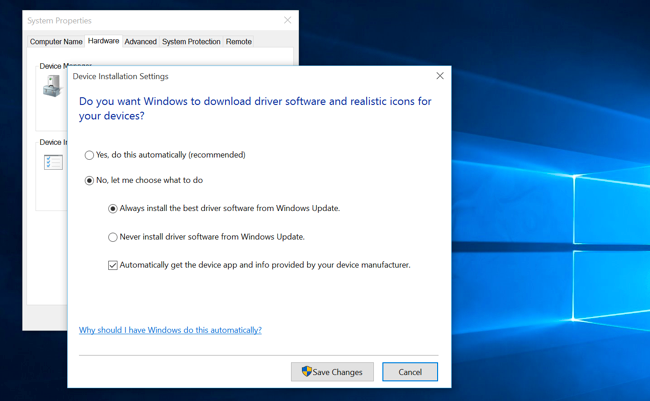 Mandatory driver updates are another issue — rather than just pushing MIcrosoft’s own Windows updates to everyone, Microsoft is forcing you to install the latest drivers it thinks will work on your computer. There’s no way to opt out of these drivers if they don’t work for your hardware. Install your own custom drivers and Windows Update will repeatedly install its own drivers over your own custom ones. There’s still a “Do you want Windows to download driver software” setting buried in Windows that claims it will stop Windows Update from installing drivers, but it doesn’t actually work. Microsoft didn’t bother removing it, though, which just confuses everyone. The only way to get around this is by blocking individual driver updates with a special tool you have to download from Microsoft’s website. 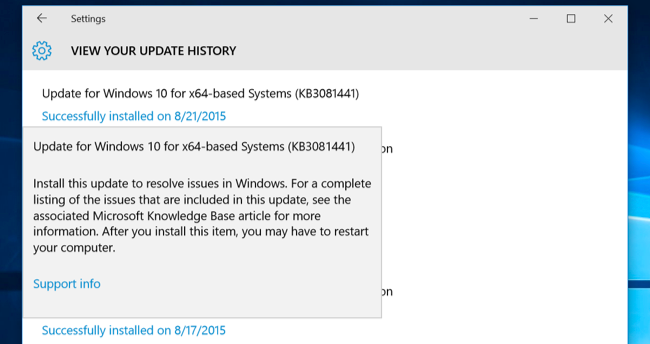 But you’ll get new drivers when a newer version appears in Windows Update. Mandatory security updates are one thing, but Microsoft should allow PC users to have control over their specific hardware drivers if they need it — even if this is just a hidden option you have to enable. These are just a few of the ways Windows 10 falls flat on its face. There are certainly others. The continued separation between the Settings and Control Panel apps is silly. The white titlebarsare ugly to many people and a sad step back from the colorful Windows 8, although Microsoft seems to be realizing their mistake and adding color choice back in. And people who depended on the unique placeholder files functionality in Microsoft OneDrive on Windows 8.1 will be disappointed to find it’s been completely removed in Windows 10.